Hogfish fishing Florida Keys Style is all about expecting the unexpected. You will spend a great day, soaking up the rays, sinking a few beers, and reeling in fish after fish, we have no doubt about that. They are more difficult than you might have been led to believe. In fact the majority of them are speared by divers, but every now and then when Hogfish fishing Florida Keys fisherman sitting in their boat can get lucky. So what can you do to make sure that when you go Hogfish fishing, Florida Keys waters do not leave you high and dry. Well the first thing is knowing where you should fish and of course what the fish looks like. Let’s start with their appearance, so when you get a tug on the other end of your line, you know if you are bringing one out of the water or reeling in another one of their fishy friends. 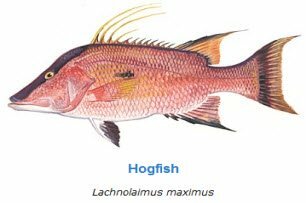 What Does The Hogfish Look Like? The hogfish has a long snout a bit like a pig. And you don't want to get a nip from its strong teeth that are similar to a dogs. Its colour changes as the fish gets older and bigger, but quite often will be a pinky orange, but the scales on the back are often edged in yellow. If you look at the back of the Hogfish you will see a dark spot at the back of the dorsal fin, this will indicate quite a young fish, as overtime it fades and then disappears altogether. The male hogfish is the proud owner of a dark stripe that spreads across the top bit of their heads, going all the way to the furthest point of their snouts. Younger hogfish are lighter in colour than the adults, and will mainly be either gray or pink with white mottled scales on their sides. The good thing, is when you go Hogfish fishing Florida Keys waters offer you great choices, as the fish can be found anywhere in the Keys. It can be found throughout the Gulf of Mexico, where it has been caught as far north as the Carolinas, and as southerly as the north coast of South America. So it isn’t exactly hidden. It also swims in nearly any depth, which makes our search for this elusive fish slightly easier. They tend to like areas with sea fans on the bottom that they use for cover, so the 15 to 30 feet depths found in the coral reef are a good location to begin. Remember, if you don't go too deep the water will remain clearer which always is beneficial when Hogfish fishing Florida Keys Waters. Florida Keys have a strong current around the islands so if you are having a slow day on the reef and nothing is biting, then think about shifting to Hogfishing until the current changes. Most anglers find that they easily reel in a few Porgies whilst fishing for the Hogfish anyway, which make a nice dinner for that evening. What Should You Use To Catch A Hogfish? Catching Hogfish hook and line is not all that easy. If you want to go Hogfish fishing florida keys shrimp is the favorite bait to use, don't go for the frozen variety if you can help it. Instead get them live and eager to wiggle around a bit. The old hogfish finds these hard to resist. The Hogfish spend most of its time finding food down at the bottom, so to get your line to go deep to where they are make sure that you use a jig, or at least a weight of some description. Even better get your celebration jig in order for the little dance you will do if you catch one. So as the bait goes deeper and deeper, just let it float around under its own steam, and occasionally bring it up to see what you might have on the end of your line. Most of the time you won’t feel a Hogfish bite, you just find you are hooked up when you lift your rod tip.